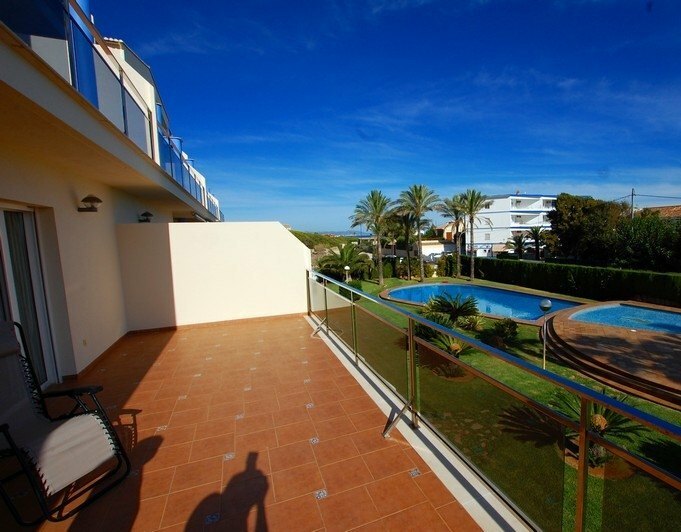 Apartment for sale in a modern luxury development at 300 metres from the first line of the beach in Denia, Costa Blanca, Alicante.Second floor with elevator, 2 bedrooms one with exit to the terrace, 1 bathroom with bath, kitchen, livingdining room with access to a magnificent terrace of 12 m 2. Total 70 m2 built on the best materials on the market: marble floors, windows, polished aluminium with double glazing, pre installation of air cold individual heat, etc...Included in the price is the parking place at the community garage, parking attached to the Hall's entrance to the staircase with very easy access. Urbanization has swimming pool, Garden, gym, playroom, sauna, WiFi and is located just 300 metres from the town centre close to all amenities.